…and this time it’s not green. 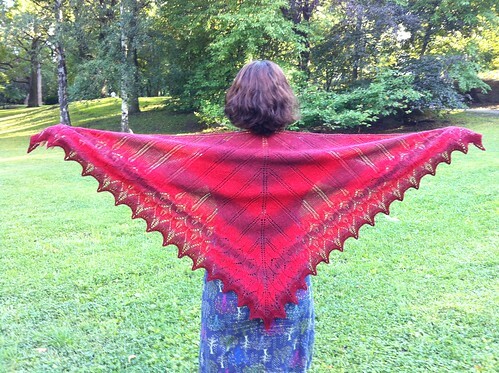 thanks to all the lovely comments about my recently finsihed cardigan and shawl! you’re so sweet! fly on your wings like an eagle, fly as high as the sun! sorry, couldn’t help it, but how can a dedicated maiden fan like myself not associate this particular knitting project with this classic maiden hit? you want to see the video, don’t you? i knew it! enjoy! ok, so what about the near disasters? well, there were three. 1) like i mentioned earlier, i forgot to remove my scissors from my carry-on luggage when we flew to greece, which was incredibly stupid because the airport security naturally picked them up on their monitor. after i discarded the scissors, the let me pass. with a tired sort of look. not me that is, i was bloody nervous! the security guard had a tired sort of look. i’m guessing i wasn’t the first to make a mistake like that… as it turned out i didn’t need the scissors during my whole stay. no disaster in the end. 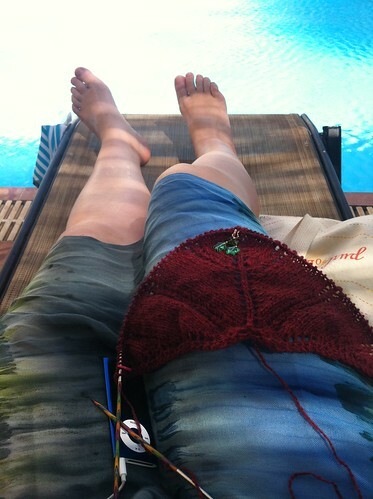 2) as i was happily knitting along in the sofa, watching the telly, i dropped something on the floor. naturally i had to lean down to see what it was. 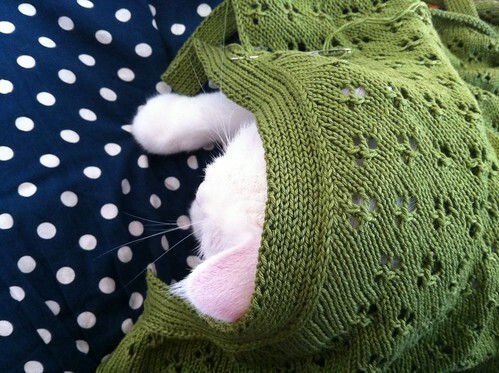 i put my knitting next to me and leaned on it. snap! that was my lovely, lovely pair of knit picks circulars that i’d ruined! since i don’t own an extra pair of 3,25 tips, i exchanged the broken tip for a 3,5. i continued with the 3,25 on the part of the circular that i used to knit the ws, and used the 3,5 on the rs. again – no actual disaster (apart from needing a new pair of 3,25’s) since this happened just as i was supposed to begin the lace bit, and it’s now impossible to tell that i’ve used different sized needles! 3) i ran out of yarn. now this could be an actual disaster, but given my happy-go-lucky type of character (what? you disagree?) i solved the problem without a frown. no, i’m only pulling your leg, of course i frowned! one alternative would obviously be to buy more yarn. but since i only had a few more rows to go, i felt reluctant. now, i know what your thinking. 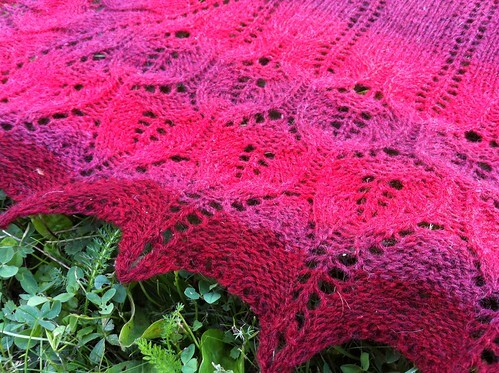 i could easily have found a good use for the left over yarn if i’d bought a whole new skein, but i didn’t feel like it. 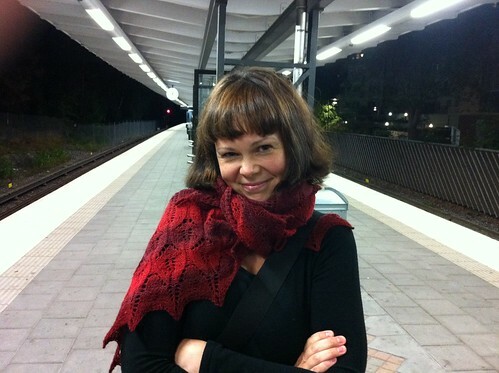 instead i decided to cheat and used the lovely deep red yarn i’d bought in estonia for the last bit. it’s thinner than kauni and the red is different. but i like it! 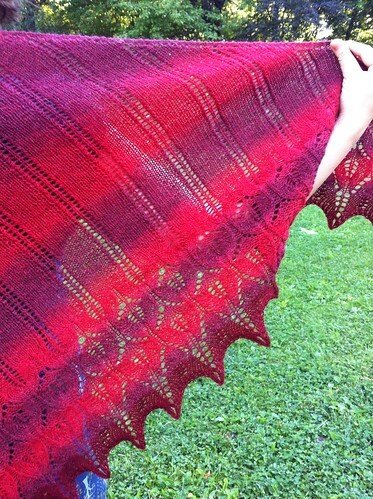 the shawl now has a much more defined edge, which i find really dramatic and beautiful. the colours look really strange in most of the photos, i blame steve jobs for putting such a crappy camera in my iphone4. the truest colour representation is in the one taken on the underground. well, that’s that and now for something completely different. in the next post! i’ve actually cast on for two projects. you’re allowed to do that you know. finish one thing and you’re allowed to cast on two. it’s actually a rule. P.S. if you can’t get enough of iron maiden, check out this lovely video of a primary school performing flight of the icarus, i laughed myself to tears! they’re so cute! and i’m blocking the crap out of it right now! 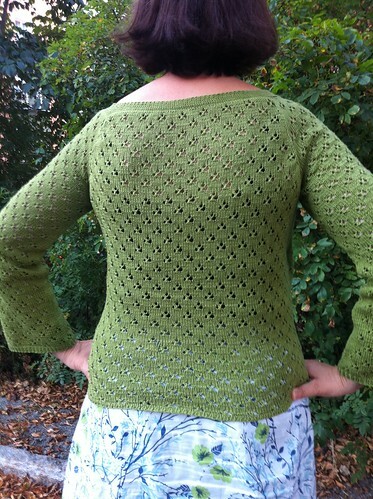 nicer photos, pattern comments, near distasters and a happy ending to come! stay tuned. i’m really glad that this old thing is finally finished. if i’d started it now, i would have made some changes and paid more attention to the details, but it’s still a wearable and quite nice little cardigan. 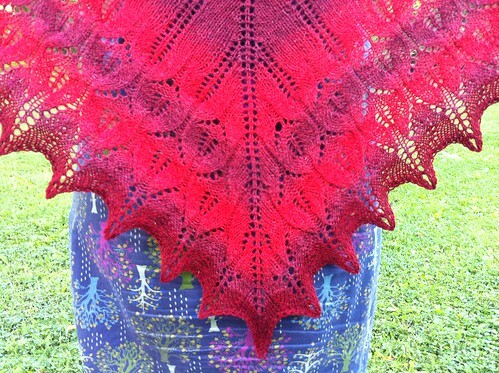 i’ve used cotton, though not the rowan 4-ply that is used in the original, instead a mercerised cotton yarn from a swedish yarn manufacturer, kampes. 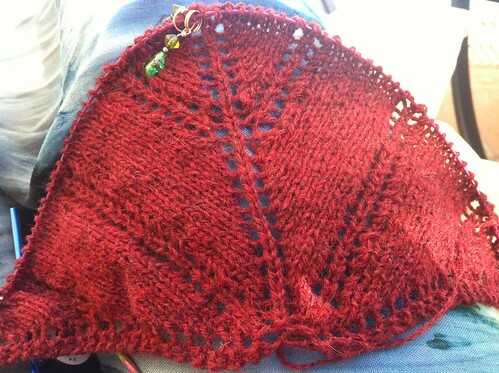 it’s slightly thinner that rowan’s 4-ply but it has a nice texture, almost shiny. 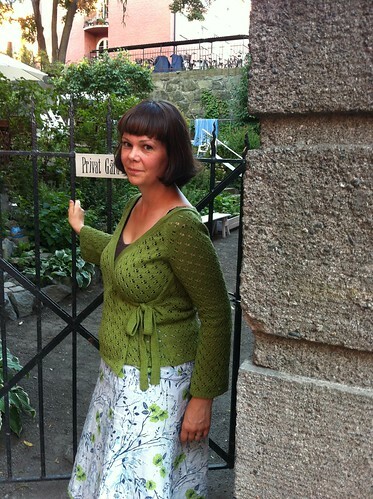 another green cardigan. i think i own at least five. i don’t really know where i first read about it, but there is a blogger who always have a drink to celebrate a finished project. i adopted this tradition a long time ago, but i usually forget to document it. 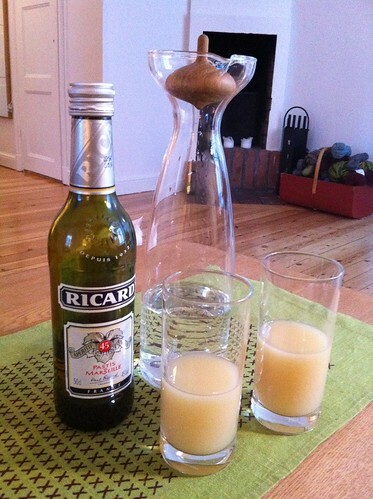 in my opinion, the most suitable drink for this cardigan is a pastis. probably because the girl modelling it in the book is wearing a beret, but i think it has a french… touch? 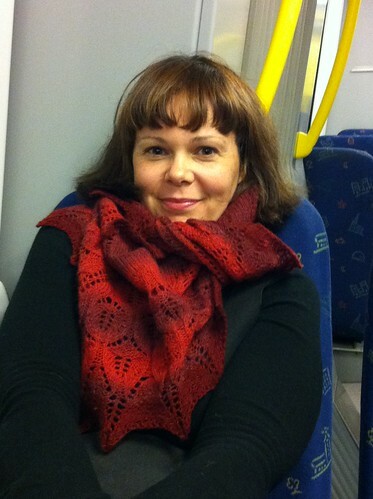 anyway, since stefan helped me with the photos, he had one too. salut! i’ve worn it twice already, although i’m not a 100% satisfied with the fit. the sleeves are a little too tight, and it’s a bit too short for my taste, but it’s still ok. my next cardigan will be woolly. and not green.